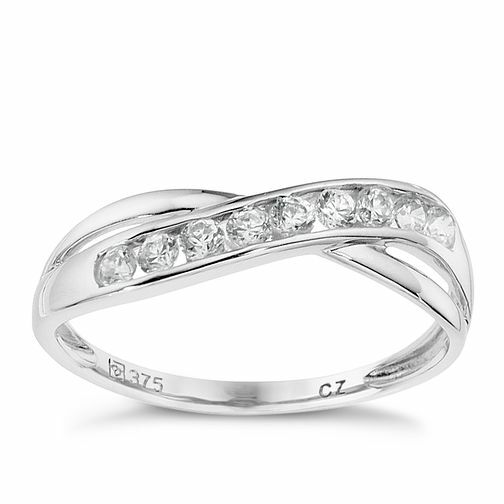 9ct white gold cross over eternity ring featuring a single channel set row of cubic zirconia. The perfect celebration gift. 9ct white gold cubic zirconia cross over eternity ring is rated 4.2 out of 5 by 5. Rated 1 out of 5 by Anonymous from Pretty but has gone out of shape within 3 days of wearing it. Very pretty ring, I bought this for my girlfriends birthday a couple of weeks ago and she been wearing it for 3 days now an already it's gone out of shape. I would not recommend this ring at all for a loved one, absolutely apauling I'm am not happy. Rated 5 out of 5 by Anonymous from Very pretty ring My daughter chose this ring for her 18th birthday present. It`s very pretty and looks elegant. Would definitely recommend.